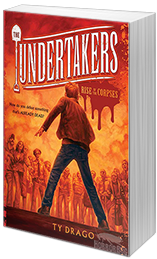 Today we're taking part in the UNDERTAKERS: SECRET OF THE CORPSE EATER Blog Tour. 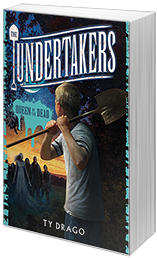 We're chatting with author Ty Drago and getting the low down on this third installment of the UNDERTAKERS series. Give a warm welcome to Ty, and don't forget to enter the rafflecopter below! Welcome to We Do Write, Ty. Tell us a bit about yourself. That's awesome. (I grew up in New Jersey too!) How long have you been writing? I've been writing all my life. In fact, I started storytelling at the age of four, before I knew how to read. I've even seen the photos to prove it! Apparently, I was a fat little kid with no shirt on who liked to scribble things with a crayon on pieces of paper and then hold them up and shout out “Cow!” or some such thing. But, you see, in my MIND, I was telling a story! Honestly, I'm a natural storyteller. A thousand years ago, I'd probably have been the weird old man who showed up at the village at sunset and, for the price of a hot meal and a warm bed, would sit at the hearth and regale the local children with stories of Robin Hood and King Arthur. Then, the next morning, I would take my walking stick and head off to the next village to do it all over again. Sadly, you can't do that in modern America because it's “creepy.” LOL! Bottom Line? I was born a writer. Tell us about SECRET OF THE CORPSE EATER. What’s the story about? The world is at war; it just doesn't know it. Beings from “somewhere” have invaded the Earth. But, since they arrive here with no bodies of their own, they animate and occupy the bodies of the recently dead. These they “wear” until they literally rot out around them, then they transfer to another, all the while telepathically projecting a false persona of normalcy that fools everyone. Well, almost everyone. Their plan: the gradual corruption and ultimate destruction of the human race. The only glitch in their plot are the Undertakers. This group of teens and preteens is somehow able to penetrate the Corpses' carefully crafted illusions. Having had to abandon their families and hide from the invaders who relentlessly hunt them, the Undertakers have formed a resistance movement to fight the war that only they know is waging. 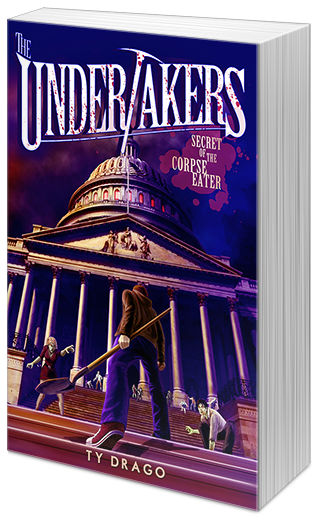 In Secret of the Corpse Eater, Book Three in the Undertakers Series, the invasion is spreading. What originally began and was largely limited to Philadelphia is now reaching down to Washington D.C., where a U.S. senator has somehow been replaced with a Corpse look-alike! Now Undertakers Will Ritter and Sharyn Jefferson have gone undercover as Senate pages to ferret out this impostor's plan. But their already dangerous mission is made doubly so by reports of a mysterious ten-legged monster who haunts the hallowed halls of the Capitol Building, a creature with a taste for Corpse Flesh! But can such an alien “enemy of my enemy” truly be the Undertakers' friend? Amazing! I read an excerpt and it was so cool. How did the idea of the story come to you? The Undertakers came out of my childhood. As a kid, I authored a lot of badly drawn comic books that I shared with my friends. These centered around a group of child superheros that I called the “Kid Kidets.” I was eight year old, you see, and didn't know how to spell “cadets.” Anyway, the Kid Kidets had all the typical superhero powers. Some could fly. Others were super strong. Others could control the weather, move things with their mind, etc. They were captained by a brother and sister team named Tom and Sharyn Jefferson, and their secret HQ was a huge installation located deep below the ice in Antarctica (don't ask me why!). Whenever trouble brewed anywhere in the world, this entire installation would rise up out of the ice and the Kid Kidets would head off into the world to write some wrong. So I started trying to come up with an idea, and I suddenly remembered the Kid Kidets. Not the superhero/Antarctic installation nonsense, but the idea of a child army. A army of just kids, fighting a war that only they can fight because only they know about it. The Undertakers are pretty much the Kid Kidets grown up, so to speak. They can't fly worth a darn, and their hidden HQ is a crumbling sub-basement beneath Philadelphia gargantuan City Hall. But the same theme carries through: children make the best heroes. And they're STILL captained by Tom and Sharyn Jefferson! That is so awesome. Give Andy a big thanks from us! Are you a plotter or a pantser? Not sure if I like the term “pantser!” LOL! But I know what you mean, and that's definitely me. I don't work from outlines. When I write a book, I pretty much sit down with an idea and start typing and just let the story take me where it will. I'm often surprised and almost always pleased with the results. I hope my readers are, too. The waiting. There's a lot of waiting in this business. Once you've poured your heart and soul into a story, edited it, polished it, and sent it off for someone to read, the rest is just twiddling your thumbs and hoping for a positive response. I fill the time, which can often be months, the only way I know how: by writing something else! Excellent tip! What do you absolutely have to have nearby when writing? Really, nothing. I do all my writing on my iPad, and I can do it pretty much anywhere. I've written on buses, trains, airplanes, even in the car during lengthy traffic jams. I have a home office and I certainly do a lot of work there, but I also move around the house, trying different spots. This can be helpful when you're stuck on a plot point and need a fresh perspective. That may sound weird to a non-writer, but it truly does work. I agree. What are you reading right now? “True Blue” by David Baldacci and “American Gods” by Neil Gaiman. I'd lean toward to subtler superpower. I'd like the “push” that Stephen King created for “Firestarter.” It would be a way to get inside someone's head and plant a powerful suggestion that they simply have to obey. In the book, the heroic father, Andy McGee, can turn to one of the killers hunting them and say “You're Blind” or “That gun is much too hot to hold.” And his words have power. That would be an amazing ability to possess. Wow, I'd love that power! I'd choose that too. What's the weirdest thing you've googled? Wow. That's a hole with no bottom. You're talking to a man who did a tremendous amount of research on how human bodies decompose! But the weirdest thing? I'd have to say the blueprints on how to make a steampunk pistol. That was for a YA novel I've been writing! LOL, I probably shouldn't laugh, but that's a perfect answer. And finally, where can people find you and your books online? As for me, you can reach me on by blog site at www.tydrago.com. I love fan mail! Or, if you want to keep up to date with all things Undertaker, you can check out www.jointheundertakers.com. The book trailers are there, as is my calendar of speaking engagements, character bios, special news, etc. Ty, thanks so much for taking the time to chat with us today. I hear your book sold out on Amazon on launch day, so here's to your continued success!